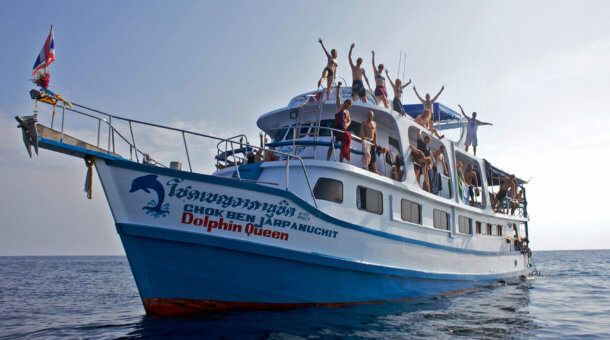 Cruises in the Similan Islands / Richelieu Rock and also into Myanmar (Burma) with the liveaboard "Deep Andaman Queen". This stylish and comfortable liveaboard started operating in November 2003 and has been operating in Thailand for 14 years. Still one of the best liveaboards in the region, at 28m in length, she is also one of the larger Similan liveaboards. All cruises depart from Thap Lamu port near Khao Lak, with free transfers by minibus available from any hotels in Phuket or Khao Lak. 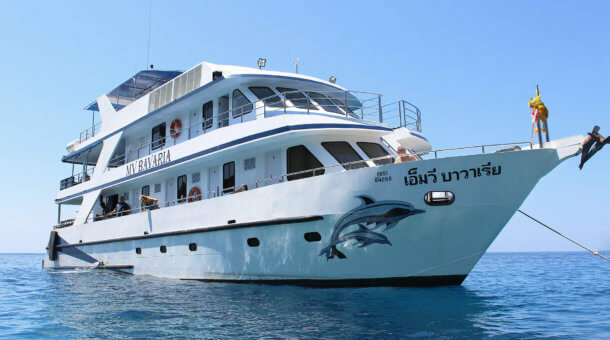 Deep Andaman Queen offers a very good deal for diving in Thailand and Burma. Deep Andaman Queen has several cabin types – Master and Deluxe on the main deck, and Standard on the lower deck. All cabins have private bathrooms with hot water, and are all air-conditioned. The Master cabin with Queen size double bed is one of the largest on any liveaboard and includes private TV and DVD. 3 of the Deluxe cabins are double bed, making this a great boat for couples – many Similan liveaboards have only twin beds. The other 2 Deluxe cabins are twin bed. The Master and Deluxe cabins all have ocean view windows. On the lower deck are the Standard cabins – there is one twin, one triple and one quad cabin. Deep Andaman Queen takes a maximum of 21 customers, and will have 4 dive staff on board. The dive deck is very large, giving plenty of room for suiting up for your dives. A 4m RIB (tender) helps with pick ups after the dives. After your dives, catch the rays on the huge sun deck on top of the boat. As a bonus, this is one of the few boats with free WiFi (when in rage of Thai mobile phone signals). The indoor salon, also aircon, is equipped with TV, DVD and entertainment centre. There are power points in all cabins and the salon for charging batteries. Food will be Thai (naturally) with some Western dishes, all served buffet style. Customers say the food is very good! Rental equipment is provided by Sunrise Divers for our divers on the Deep Andaman Queen liveaboard. Rental price is 500 Baht per day for a set (BCD/regulator/fins/mask/wetsuit) and 250 Baht per day for a dive computer. We have a large equipment room at our dive center with 30 sets of Aqualung BCDs and regulators and a large selection of long and short wetsuits, open heel and full foot fins. Torches for night dives are provided at no extra cost. 15 liter tanks extra 350 Baht per day. Nitrox is available on board @ 250 Baht per 12 liter tank fill, or 2,000 Baht for 4 night trips, or 3,500 Baht for 7 night trips. PADI Advanced Open Water course is 8,000 Baht. PADI Enriched Air (Nitrox) course is 8,000 Baht. Drinking water, coffee, tea, sodas are included. Beers 120 Baht. Wine 800 Baht per bottle. 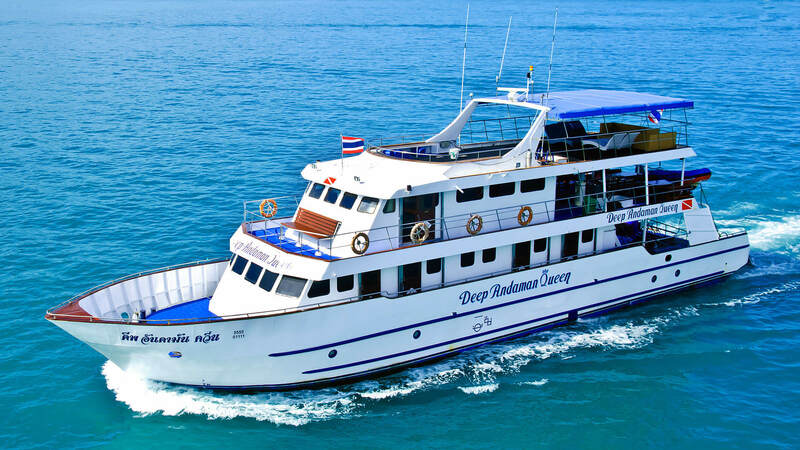 Deep Andaman Queen runs trips for 4 nights to the Similan Islands, Koh Bon, Koh Tachai and Richelieu Rock plus 7 night trips to the Mergui Archipelago in Myanmar. Note : This is an approximate itinerary. 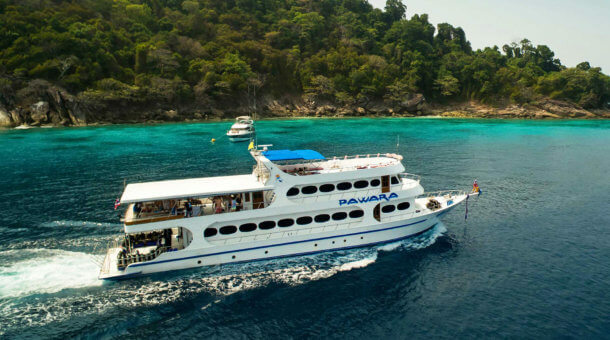 The 7 night trips include about 23 dives at the Mergui Archipelago, plus Richelieu Rock, Koh Bon, Koh Tachai and a couple of dives at the Similan Islands or Boonsung Wreck. Exact dive times will vary from day to day. There will be time for some beach visits in Myanmar.